Good decision making is essential in talent acquisition and employer branding, and it does not happen by accident. It requires a reasoned choice among competitive alternatives. Talent acquisition leaders in today’s unpredictable but data-rich decision environments who want to develop effective decision-making skills must learn the art and science of decision making and then apply those lessons in practice. 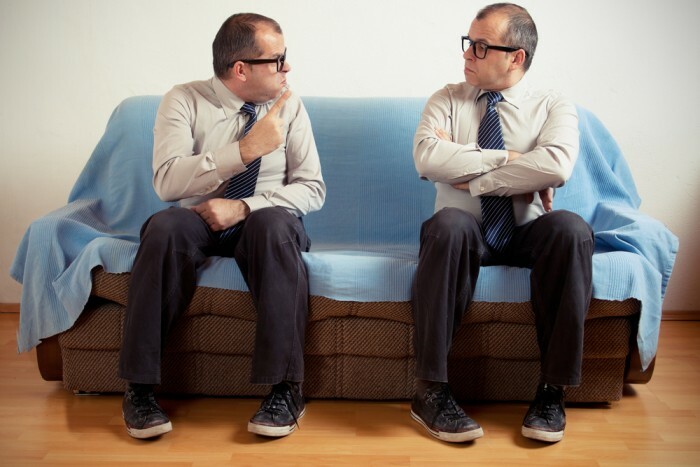 Recruitment leaders make frequent decisions about candidate engagement needs. In making these decisions, they choose from among many alternative course of actions in a complex and uncertain world. Most often, they would tend to follow an intuitive decision making process comprised of judgment calls based largely on their mental models of the world, developed throughout their own experiences. In many cases, such mental models, perhaps backed by market research data, may be all that these leaders need to feel confident about their decisions. Yet, mental models are prone to systemic errors. Although everyone recognizes the value of experience, any experience is unique to each person and can be skewed towards particular points of view. Simply put, traditional recruiting leaders might not want to invest in inbound talent marketing and focus on outbound activities instead, while innovative ones see it as a precursor for amplifying the employer brand. An alternative approach to making decisions about social recruitment expenditures can employ a decision model of how the talent pipeline will respond to various expenditure levels. Talent acquisition leaders can then use this model to explore the inbound vs. outbound talent pipelining consequences of alternative expenditures levels before making a decision. In an organizational setting, the social recruitment engineering approach requires the design of decision models and its deployment in the form recruitment management support systems. The purpose of social recruitment engineering is to simplify the decision context and create a decision architecture to help focus on the key issues. Without simplification and a process-oriented approach, noise rather than insights drive people’s decisions. A good decision model therefore focuses attention and limited resources on the decision at hand. In addition, social recruitment engineering aids recruitment leaders by providing a platform to cover and test different use-case scenarios, enabling them to assess the opportunity costs associated with their decisions and determine the potential value of alternatives they chose to reject. For example, if a recruitment professional must select between two social recruiting techniques and chooses the most cost effective one, the social recruitment engineering approach can help assess the foregone increase in talent pool of the higher-priced option. This capability of the social recruitment engineering is critical. In reality, leaders can observe only the consequences of actions they have actually taken, but social recruitment engineering helps them understand whether they might have made better decisions to begin with. 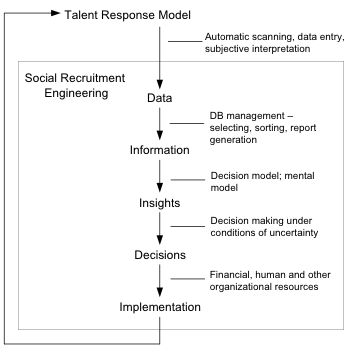 The following figure shows how the social recruitment engineering approach transforms objective and subjective data about the talent environment into insights, decisions and actions. Inputs: Social recruitment actions that talent acquisition (or employer branding) professionals can control such as segmentation, positioning, and the like (also referred to as “marketing mix”) as well as non-controllable variables such as talent brand or the competitive environment. Objectives: The measure the recruitment organization uses to monitor and evaluate actions. Talent response models are approximations of likely talent community or candidate behavior and thus may vary, sometimes substantially, from the unknown, true responsive behavior. In some sense, all models are wrong, but many are useful. Model users must choose among those that are useful and those that are not. One model form is not better than another; rather, each is useful in some situations and for some specific objectives. Although various criteria dictate which model to select, here are four that apply quite well. Model specification — Does the model include the right variables to represent the decision situations? Model calibration — Can the model be calibrated through experimentation? Model validity and value — Does the model reproduce the current talent environment reasonably accurately? Model usability — Does the model give recruitment leaders guidance that makes sense? When a model is selected, you can summarize these criteria into one overriding question. “Does this model make sense for the situation?” That is, does the model have the right form, can it be calibrated, is it valid and is it useful? If the answers to these questions are all yes, then the model is appropriate. Tamer Rafla is a serial tech entrepreneur and the founder of Klujo, a social recruitment technology that uses gamification to help boost your employer brand. With a background in management consulting he led several business transformation initiatives with clients in the high-tech, travel and pharmaceutical industries. Often called upon to peer review academic papers for reputable scientific journals, he holds a master’s degree in software engineering and in business administration.